Most readers I have the chance to talk to are a bit wary of nonfiction. Too easily, it can be dry or dull, the authors sacrificing style to facts and story to accuracy. But then, there are those authors who tell true stories in a way that is transcendent. They pull the reader into the story, engaging the imagination and writing with passion, feeling, and a vibrant voice. Norfolk author Mike D'Orso is one of the latter. 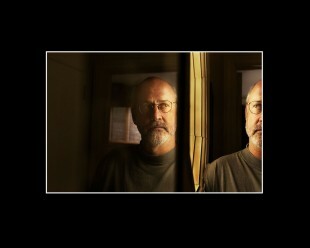 His narrative nonfiction works authentically recreate the voices and stories of his subjects. Whether writing about a Native Alaskan basketball team or black slave genealogy, D'Orso cuts to the heart of the story and presents it to the reader in ways both accessible and captivating. I recently had the privilege of sitting down with Mike to chat with him about his path to becoming a writer, what he finds inspirational, and "the big hurt" inside us all. Tell me about how you got to where you are now. Was writing always a passion for you, or did you stumble upon it? It wasn't something that I was always passionate about. I grew up as a military brat, which exposed me to lots of people and ideas. I was always curious about what made people tick. Then, I was exposed to books that opened my eyes. Books like Slouching Towards Bethlehem by Joan Didion, Dispatches by Michael Herr. It struck me that these were true stories. These words were true, and stood up from the page, and had a voice and grabbed me. I began to devour similar writers, like Tom Wolfe and Hunter Thompson. It was so exciting to me. This was authenticity. I read voraciously for the next few years while I was traveling and in school and exploring life. It sounds romantic in retrospect, but at the time I didn't know it would lead to anything. So what happened next? How did you transition into writing as a career? I came back to Hampton Roads and started teaching 10th grade English at Kempsville High. I'd always loved sports, so once I was at Kempsville I started writing a weekly sports column for the Virginia Beach Sun. These clips would eventually turn into my currency and open the door for other opportunities. But at the time I wasn't even thinking about writing as a career-it was something to blow off steam. I went back to William & Mary to get my MA in English, and in the meantime I wrote for the college and had an offbeat sports column for the Virginia Gazette. Unintentionally, I was in writing school. My teachers were always other writers, the best working in narrative nonfiction at the time, writers for Esquire, The New Yorker, Rolling Stone. After graduation, Commonwealth Magazine offered me a job. After a few years, I moved to the Virginian-Pilot. I worked with a fabulous team at the Pilot, and it was one of my stories there that caught the eye of a Doubleday publisher. That story, which became the book Somerset Homecoming, launched me into books. Can you tell us a bit about your writing style and how it has developed? It goes back to what I'd said about authenticity. My voice is dictated by the subject, the tone of their story. Ultimately it's about the people in the stories. 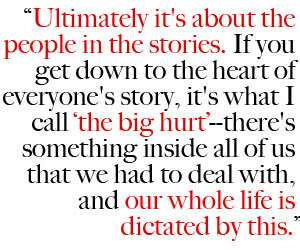 If you get down to the heart of everyone's story, it's what I call "the big hurt"-there's something inside all of us that we had to deal with, and our whole life is dictated by this. So I like stories that are personal, that get deep. Ninety percent of what I do as a writer is getting the story, finding it, understanding it. I try to find a moment that resonates, and recreate it for the reader. So tell us a bit about the project(s) you are working on now. I usually focus on one book, one story, and launch a new project as I'm wrapping up the first. Right now, though, I have two projects going. One is a collaborative work with (NFL Running Back) Ricky Williams-it's been a longer project that usual. Ricky's story is so volatile, it has been a story in progress while I've been writing. There is still so much to tell. In the meantime, I'm starting another collaborative project with Ted Danson, who has been a longtime advocate on behalf of the oceans. He is part of the leadership of Oceana, a foundation dedicated to ocean conservation. Everyone is concerned with the land, but the ocean is a frontier in terms of environmental awareness. For that project, I'm focusing on research, prepping for several research and reporting trips. Let's switch gears a bit. You've been a longtime Norfolk resident: what do you love best about the area? I lived in 13 cities before I was out of high school and with the research for my books I've seen the world-but there's no place I'd rather be than right here. From my house looking out at the Lafayette River, I'm five minutes from downtown, from Ghent. Norfolk has a great intimacy, a sense of connection. This city is just the right size, and working for the newspaper for so many years connected me to the community in a way that most people don't have the chance to be. This connection, this intimacy-how can you be more alive? What are some local spots that inspire you? The Hermitage is a hidden treasure. The grounds are beautiful, it's a great place to have a picnic lunch, play with a boomerang. For holidays like the 4th of July, I love to go to the Waterfront in front of the Chamberlin Hotel, and watch the fireworks over the water. First Landing State Park is a beautiful place to go bike riding. The local golf courses have exposed me to some of the regional beauty: the wetlands and the marshes of the Suffolk area, or the Eastern Shore and its spectacular vistas. Even beyond the region, I'm attached to Virginia. 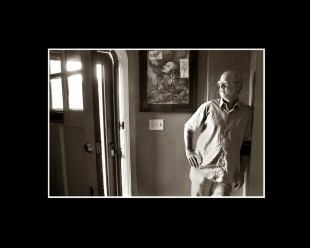 For three years with Commonwealth Magazine I went to every nook and cranny of this state. It's a huge state-from inner-city Richmond to coal country in Grundy to the Blue Ridge mountains. I love this state. Gary Smith is my favorite writer. He writes personal, emotional stories that move me. He's had a few collections come out recently, and The New York Times featured him last year. The best fiction writer I discovered in the last ten years is Cormac McCarthy. I also enjoy TC Boyle and Pat Conroy, especially his earlier works. The Great Santini was the story of my life. My heart has always been attracted to the sadness, the angst that can be beautiful. I also love Tim O'Brien, John McPhee, Milan Kundera, Dave Eggers. And Leonard Cohen-his songs are poems. In nonfiction, I loved Richard Preston's The Hot Zone, and anything by Jon Krakauer and Richard Ben Cramer. Which is your favorite of your books? A favorite is Walking with the Wind, which I wrote with civil rights leader John Lewis. It was such a moving experience for me to drive with him throughout the deep South, to walk in the footsteps where he was beaten, imprisoned, and electrocuted, and then to see how still today he has the sweetness of the nonviolent movement. I'm proud of how that book has been embraced because of the story he had to tell. I feel the same way about Like Judgment Day, which was the basis for the movie Rosewood. These are the most important books I've written. Personally, Eagle Blue has been a favorite. Native Alaskans are understandably suspicious when they see a white guy come asking questions. The fact that I lived there amongst them and got at the heart of their story, it really allowed me to penetrate through the darkness to the people and families and lives. There's goodness there, holding this community together. It is rewarding to find that. And to have been embraced by the natives, that's the greatest compliment in the world.